In 2016, the lefty was named Rhode Island Gatorade Player of the Year, Providence Journal All-State Player of the Year, First Team Louisville Slugger All-American, and USA Today First Team All-USA. His time with The Prout School in Wakefield, Rhode Island was certainly great, so Feole didn’t want to venture too far from home. Feole is just a freshman, but you wouldn’t be able to tell. His seven wins in the regular season lead all Huskies pitchers, including two victories against nationally ranked teams. This summer, Feole is heading to the Gatemen for his first year in the Cape Cod Baseball League, but it isn’t his first experience playing collegiate summer baseball. He made five starts last summer for the Worcester Bravehearts of the Futures Collegiate Baseball League the summer after his senior year of high school. The Gatemen have four preseason exhibition games against FCBL teams between June 5th and June 9th. But as a New England native and a lifelong fan, Feole’s is achieving one of his biggest baseball goals this summer with the Gatemen. He’s also following in the footsteps of one of his favorite Major League Baseball players, Nick Swisher. 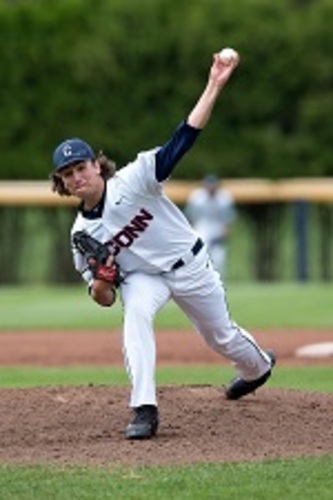 You can listen to Mason Feole’s full interview with Gatemen broadcaster Connor Federico, as they talk about Mason’s New England roots, his great freshman season with UConn, and his personal keys to success by clicking here.